When using herbal remedies for stomach problems, it's a good rule of thumb to always check with a doctor or licensed homeopathic care provider. Stomach problems often accompany other issues, and some stomach problems can be very serious. Once you rule out anything serious with a professional, there are some great herbal remedies for common stomach issues. Fresh: Herbs cut fresh can be used. Sometimes fresh herbs are eaten raw and sometimes brewed into a tea. Dried: Dried herbs can also be brewed into tea, or sprinkled onto food. Generally, the fresher the herb, the more potent medicinal qualities the treatment will possess. So, fresh is often considered a better choice than dried. Infusion: You may hear the term infusion, but it simply means almost the same thing that "tea" does. It's herbs steeped in boiling water and left to sit until preferred potency is reached. Depending on the herb, a cold or hot infusion can make a difference - one reason it's smart to work with a care provider, unless you're very sure of your herbs. Decoction: The best way to explain this is as a reduction. You start with dried herbs, which you cover in cold water and bring to a boil slowly. Then you simmer until the volume is reduced by half. Pills: Usually bought. While you can make your own herbal pills it's best to buy them from a reputable herbal company. This is a hefty topic - there's no way to go over prep and best use for each person personally. Check the above links for more information and as noted before, locate a reputable care provider; one who is knowledgeable about herbs. If you're pregnant or nursing, never try herbal, or any other medicinal treatments, without first running it by your midwife or doctor. Herbs, like traditional drugs, can have harmful side effects for you and your baby. Drink an infusion of Prunella as it calms down inflamed mucous membranes. You can use a Prunella infusion up to three times per day. Essential herb oils are also good. Oils like lavender, chamomile, thyme, tea tree, peppermint and red thyme can help. However, different oils perform differently, say for, diarrhea caused by nerves and stress, infection, or food. That's why having a good essential oil book and herb book on hand is so important. For upper abdominal pain try three to four drops of peppermint essential oil mixed with three drops clove essential oil, and a scant two teaspoons of apricot base oil. You can use another base if you like. Rub over the actual painful area in a clockwise motion. You can also try herbs such as thyme, chamomile, anise, coriander or fennel in tea or essential oil form. Truthfully, constipation is best treated by healthy diet changes, but for short-term relief try five drops of patchouli essential oil, along with 10 drops rosemary, and five peppermint, diluted in a tablespoon of base oil, rubbed clockwise on your lower stomach area. Ginger is a great cure for nausea - fresh grated is best. You can also infuse cinnamon or cloves. Essential oils that work well include coriander, cardamom, lavender and often peppermint. Caraway, fennel, cloves, allspice, root ginger, cardamom, aniseed and many more herbs can help to relieve excess gas. Try an infusion made with crushed seeds or make a tea of fresh herbs. You can also cook with them. The essential oils lavender, Roman chamomile, sage, peppermint, red thyme and clary-sage can all be mixed with base oil and applied to crampy areas to relieve painful menstrual cramps. 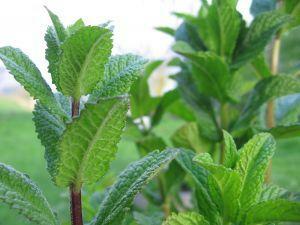 Skullcap tinctures are also helpful, or try a hot infusion of raspberry leaf, valerian, or chamomile. If you can't tell what's wrong, or have a sharp pain, see your doctor. If it's a dull ache, like the kind you might have after frequent vomiting or diarrhea, try chamomile tea. Something to note: the most fragrant herbs are often the best herbal remedies for stomach problems. That said, if you suffer from frequent digestive issues, try sprinkling your food with, and cooking with, the most aromatic herbs you have in the cupboard or garden. Good picks are rosemary, fennel, horseradish, ground aniseed, dill, mint and more.